Our unique treatments, inspired by Africa's rich heritage, were created to celebrate mother earth's connection with life. TheraNaka™ consists of only the finest ingredients available from nature while honouring the eco-system. 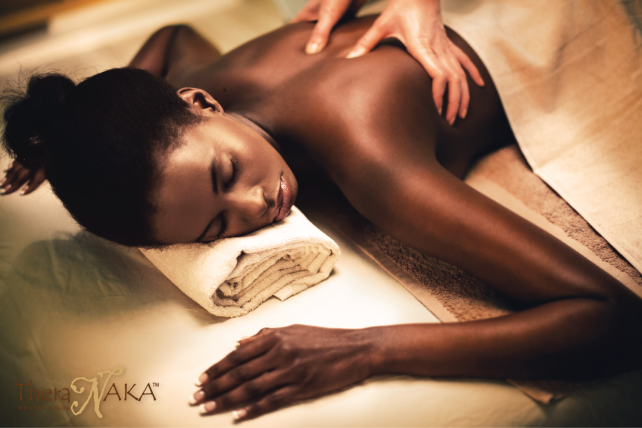 From heavenly aromas to herbal purity, TheraNaka™ is a mesmerising, healing, and innovative body & sense-soothing safari that replicates earthy scents and awe-inspiring African wonders. An innovative and unique body therapy spa range containing an abundance of exotic aromatic scents and natural herbal infusions with reputed healing properties – Africa provides the ultimate sensory experience for natural therapy as well as complete relaxation & rejuvenation. From heavenly aromas to herbal purity, TheraNaka™ is a mesmerising and innovative body & sense-soothing safari, replicating the earthy scents and awe-inspiring wonders of this most profound continent. TheraNaka™ – “Where I Stay, the Beauty of Africa”. Since the earliest time, Africa’s original inhabitants lived in harmony with nature. Our unique treatments and rituals were inspired by, designed and based on Africa’s rich heritage and created to celebrate mother earth and her connection with life. Understanding our mutual interdependence with earth, TheraNaka™ has been developed using only the finest natural ingredients available from nature while honouring the eco-system. May this journey into Africa open your eyes to preserve our beautiful continent.